Our step-by-step Love Buying a Home Series will take you through the entire home-buying process — from finding a buyer’s agent to settlement day, and even to maintaining your home after you’re all moved in. 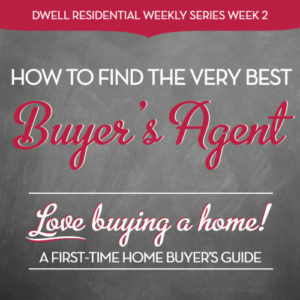 Every first-time buyer will find this information-packed series easy to follow and understand. Make sure to tune in for the next few weeks! The first item on the agenda when you’re looking to buy a home is to choose a real estate agent that is the best person to represent you, and also someone that can help you through every single one of the many steps in buying a home. You will be spending a lot of time with this person, so make sure it’s someone that’s right for you and your specific home buying needs and goals. 1. Recommended by friends, family, and co-workers. They’ll give you honest, unfiltered feedback on what they went through and if they’d go with the same agent again (a key sign!). After you get your tribe’s feedback, first check out an agent’s website to see if they are still active and also passionate about working with buyers like you. Some agents focus on a particular price range (such as a high-end market) or neighborhoods, so even a great agent for your friend may not work for you because of your different needs and budget. Remember, you don’t have to go with the first agent you meet. Just like when you choose a doctor or other important advisors in your life, you want to check around first and see if this is the best choice for you and your goals. 2. Specializes in the type of home, area and/or the type of buyer that corresponds to your goals. It’s better to narrow down your search to real estate agents whose expertise matches your criteria. If you’re a first-time buyer, then those agents who deal with first-timers all the time know how to provide more guidance (lots more hand-holding!) and keep up-to-date on assistance programs just for that market. If you’re a condo buyer, then an agent specializing in condos knows the intricacies of dealing with this type of purchase and condo associations. Whatever it is you are looking to buy, just make sure your agent is experienced in that particular segment of the market. Your gut will tell you if this is someone you can work with for a period of time, and if you will feel at ease when asking any questions or expressing your concerns. You’re going to have a working relationship with this person and it will be stressful and exhausting at times. Go with someone who can reduce such tension, has a sense of humor at times, and doesn’t scare you even if buying a home is a scary endeavor for you. Think of your real estate agent as your buying coach (and sometimes therapist and sometimes cheerleader and all the other things you might need along the way!). 4. Takes the time to listen to you in order to help you realize your needs and wants. You should never be forced or feel like you’re forced into anything at any time! A good agent has the skills to help you realize what you need and want by asking you questions and listening to your answers. Questions ranging from, “Do you want to walk or bike to work?” to “Do you want a large yard or green space nearby?” will help you uncover your wants and needs. This process can take time but it’s an important step before you even start visiting homes. An agent who has your best interests at heart will know that you’re not looking for just a house or a condo but a place you will call home. And most importantly, focuses on finding the right home for YOU and no one else. 5. Respects your time AND your timetable. Your agent knows you’re busy so it’s important they are organized and efficient when it comes to house hunting. They’ll ask you what days and times work best with your schedule. Even more importantly, your agent shouldn’t rush you if you’re not ready to buy (especially if you think you want more time to explore a neighborhood, etc.) or just get cold feet (that’s okay!). But a good agent also knows when you’re ready for that nudge forward if the market dictates quicker decision making. 6. Communicates clearly and regularly. Make sure your agent is easily reached via cell phone, text, or email; and gets back to you in a timely manner. And, on the flip side, that the agent keeps in touch with you on a regular basis with updates on listings and other information on your home search. A good agent will communicate and guide you step-by-step along the way when buying a home, from getting a mortgage to the final closing. Having explanations upfront on what’s expected next will help decrease any anxiety and stress since you’ll be informed and prepared. Find out an agent’s communication style from start to finish in the home buying process. 7. Negotiates well and has your back at all times. Buying a home is a business transaction and your friendly agent also needs to have negotiation skills that will benefit you and your offer. The entire transaction should ultimately be a win-win for both the buyers and sellers (you never want to play dirty!) but a good agent knows when to be assertive in order to get the deal done. Find out more about your agent’s past experiences and tactics at the negotiating table, especially when dealing with multiple offers. 8. Knows the local market inside and out. Go with an agent who really knows the local market in terms of inventory and pricing, the vibe of different neighborhoods, and just stays on top of listings so you can jump in before the crowd. Some agents are more attuned to what’s going on and this can be a big plus when homes are selling fast. Also your agent should have a network of other reliable professionals, such as mortgage lender, home inspector, title company, etc., that you may need along the way. Your agent should be suggesting them to you, and not you to them. 9. Looks at real estate as a financial tool that can empower your life. This will be one of the biggest purchases of your life and you don’t want to have any regrets. Your agent should respect how real estate can change your life for the better and see the possibility it has for your economic stability and security. A good agent knows that buying this home can be a stepping stone for your next home and so on. Your agent should want you to dream big, but still help you find ways to stay on budget. Your agent shouldn’t view this one purchase as the end of your relationship but just the beginning — expect them to be there for you over the long-term and ready to work with you when it’s time to sell and move on. They should be someone you trust to turn to with any of your homeownership concerns – a real estate resource for life! Come back here for next week’s article in our Love Buying a Home Series. We’ll be talking about how to narrow down your needs and desires so your house hunting list is realistic, attainable, and points you to a home you will love.